Ex-actor with a great voice who writes eulogies to die for! Not forgetting a few quotable ‘Quinn’s Laws of Relativity’. A romantic, but asexual, Quinn lives with her long term partner Art who runs community Channel Zero. The workstyle of a celebrant is never routine. Fake I.D. Fraud. Fights, even to the death, over wills and inheritance … Mislaid rings. Lost bride. Food poisoning. Clients of varied ages and cultures are well looked after. Even vintage millionairess Flora with the much younger lover who might be a con-artist. Quinn solves most problems but not always in the expected way. Longterm Sisters-in-Crime member and cultural risk-taker, Australian author Hazel Edwards has diverse genres amongst her 200 published books. She is best known for ‘There’s a Hippopotamus on Our Roof Eating Cake’ now touring as a musical. ‘f2m:the boy within’ her co-written YA coming of age novel about trans youth was a first. In 2013, Hazel was awarded an OAM for Literature. Review : I’ve always had a great respect for the versatile Hazel Edwards who writes children’s picture books, educational books, young readers’ chapter books, non-fiction and now crime. 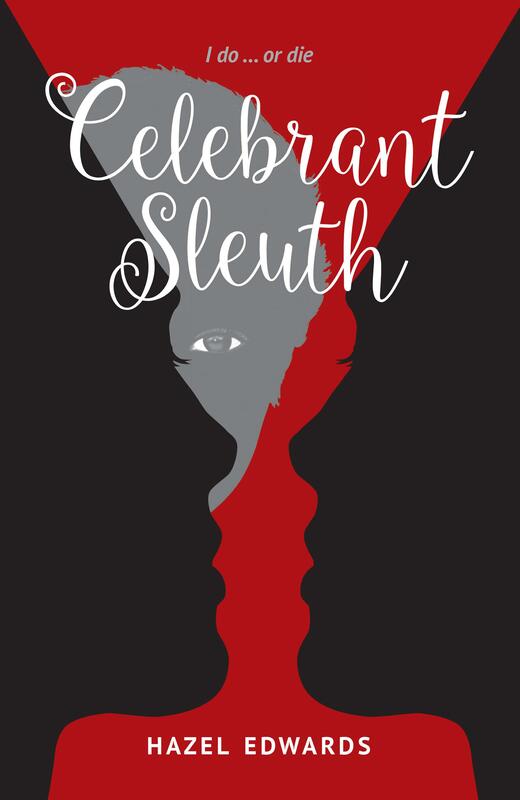 I expected CELEBRANT SLEUTH to be an Agatha Christie style novel but was pleasantly surprised to find it contained a series of mini mysteries and investigative challenges for the major character Quinn and her entourage in the form of random deaths, murders, poisonings, industrial sabotage and more. Hazel has always been cutting edge in exploring topical themes in her books, and CELEBRANT SLEUTH is no different… in this case Quinn openly acknowledges her asexuality and lives in a non-traditional relationship but it is her career that is critical to her identity—she is both an actor as well as a celebrant. Hazel Edwards provides some fascinating insights and observations into the world of the celebrant each time Quinn marries couples, conducts funerals and naming ceremonies, as well as navigates the challenges of family, social, cultural and religious dynamics that accompany each scenario. Quinn is both guide, counsellor and mediator to her clients. She even has a series of Laws and Theories—my favourite being QUINN'S THEORY OF SOUL-MATES, which states: “The number of times the word soul-mates is used in public is in reverse proportion to the number of months the relationship lasts”. This made me laugh because I think it’s pretty spot on! I also believe CELEBRANT SLEUTH is great source material for a potential television series. The setting, the backdrops of the café and the flower shop, and the cast of characters who make their presence known from vignette to vignette would translate well to the small screen as Quinn solves each episodic mystery in the context of her celebrant activities. I really enjoyed this book. It was a gentle, smooth and multi-levelled read that taught me a lot and made me feel good. Review : Celebrant Sleuth came at the right time for me--holiday reading. One advantage of the style was the ease of picking up and putting down by the story/chapter. I enjoyed both the range/variety of stories/settings plus the through lines of the characters. Particularly relevant, just post the 2017 postal survey, was the inclusive and natural way in which gender diversity was explored and presented. Whilst reading I became aware that Celebrant Sleuth would make an excellent television series. Review : Hazel Edwards’ latest detective offering features a marriage celebrant and opens with: ’I buried my father, married my sister, and sorted the missing will.’ Celebrant Quinn solves quirky problems, mysteries and the occasional murder at weddings, funerals and naming ceremonies in a country town. Divided into separate stories, some carrying on from previous tales, this is an excellent holiday read for those who like their sleuths to be more Miss Marple than Nordic Noir. Review : ‘Celebrant Sleuth’ is witty, funny, absorbing, fascinating...and I am only a few pages into it! Review : Just finished Celebrant Sleuth - I loved it. So fast moving with all the plots, sort of like short stories in their condensed style. I loved the voice of Quinn, such an interesting combination of ironic and matter of fact and sharp intelligence. Really memorable as a character. The village feel as a setting also gave a lovely intimacy and as a reader you started to get to really know the characters. Review : I like murder mysteries and this is one has a twist. I like a twist - a celebrant sleuth. With all the marriage equality, it’s a great book to read now. It gives a quirky look into the many variations of marriages which I really enjoyed. I’d recommend it. Love the cover by the way.